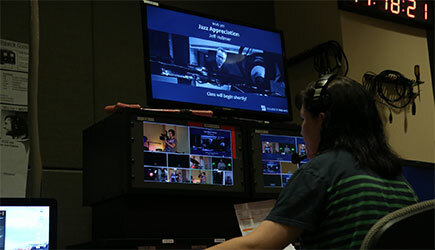 How did it come to be that 700 Jazz Appreciation students are able to watch a live, interactive jazz performance with some of the most talented musicians in the Jazz Studies program here on campus? It all starts with the meeting of Dr. Jeff Hellmer and the Liberal Arts ITS Development Studio. 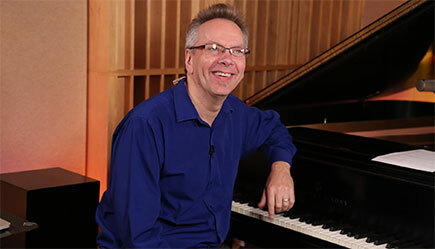 Dedicated to the art of improvisation, Dr. Jeff Hellmer, Director of Jazz Studies in the College of Fine Arts and member of the Academy of Distinguished Teachers at UT, approached the Development Studio of Liberal Arts ITS in 2016 to transform his traditional Introduction to Jazz Appreciation course into a live online course. The task at hand: how do you take a course centered on student/teacher dialogue about jazz and bring it to hundreds of students simultaneously in a live online course? The answer would prove to be careful planning between Hellmer and the Development Studio. Hellmer draws upon his years as a live performing musician and an outstanding educator. He also benefits from his experience creating a massively popular online EdX Jazz Appreciation course. Since 2014, the Development Studio has worked with dozens of faculty looking to expand their teaching modes and integrate modern technology into their approach. Staff members and Student Technology Assistants (STAs) contribute to the effort and provide professional expertise in a live studio setting. Other STAs provide graphic design elements for the courses. Others have programming backgrounds and help develop unique educational tools for faculty. All members of the team will come together to work with Dr. Hellmer and his vision for Jazz Appreciation online. After initial meetings, it is quickly decided that a live jazz performance should be an integral part of a course. The Development Studio kicks into gear and begins renovating its audio studio to accommodate cameras, lights, and it even transports the beautiful Steinway piano that Dr. Hellmer would play during class every day. The course will have several elements that keep students engaged with the material: live lecture, an in-person discussion group for several students in the studio, and guest interviews with professional musicians. On the day of the performances, Dr. Hellmer brings several performers to class, the majority of which are grad students in the Jazz Studies program who were also TAs for the course. One by one, each musician files into the studio with their instruments as the Development Studio team helps acclimate them to the new venue. Fifteen minutes before class, the recording studio becomes a high-energy space with several STAs scrambling to finish their final preparations for the show. Camera crews ready the 5 cameras in the room, the audio team sound-checks the 12 microphones placed strategically to optimize the sound of every band member, and the band itself prepares for its first live-streaming concert in an online course. Once underway, students use online software tools built by the Development Studio to respond to questions from their professor. They answer polls and decide which popular jazz standard the band plays next. And finally, they participate in a Q&A with the band after the concert. Hellmer ends the class by encouraging students to reach out to him and his band members. 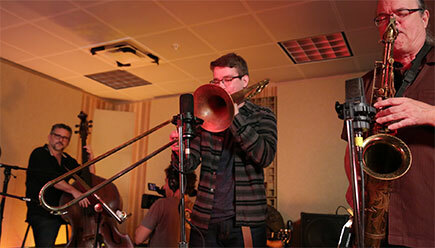 The first live interactive Jazz performance is a success and is well-received by students. Hellmer and the Development Studio go back to the drawing board to plan and improve the model for future performances.